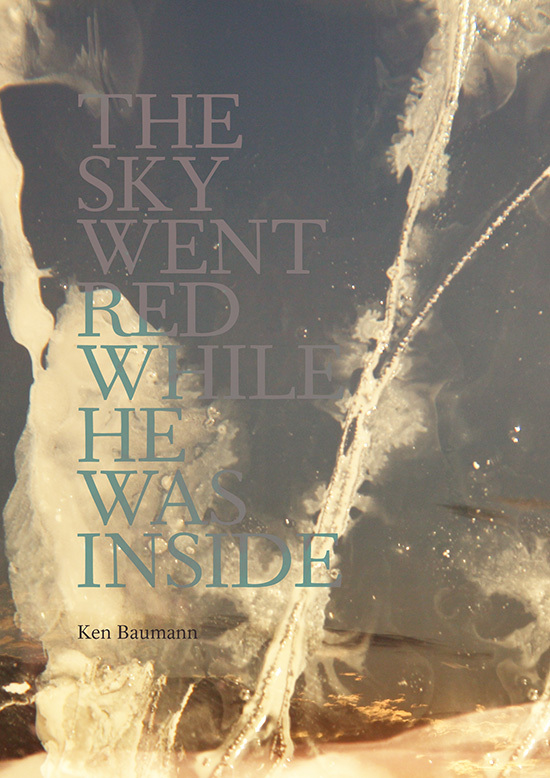 "THE SKY WENT RED WHILE HE WAS INSIDE"
The narrative of Ken Baumann's "The Sky Went Red While He Was Inside", formed by a series of poetic and visually evocative vignettes, is about a man and a woman, mutilation, and the damaging and healing effects of common thought. 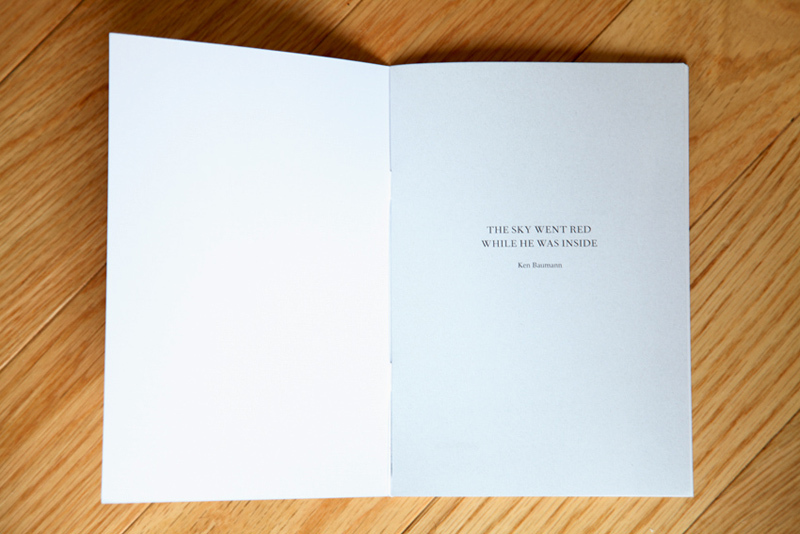 32 page chapbook with colour cover printed on textured 300gsm art stock and black and white risograph-printed inside pages. 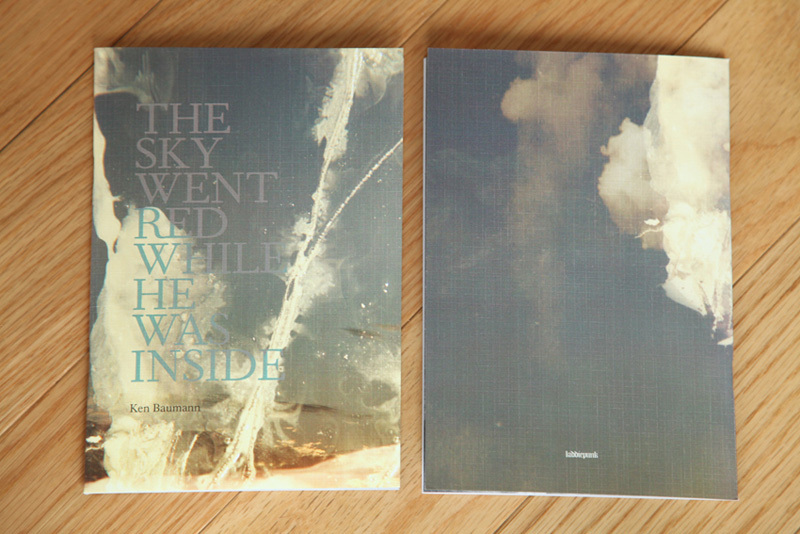 Limited edition of 70 copies. 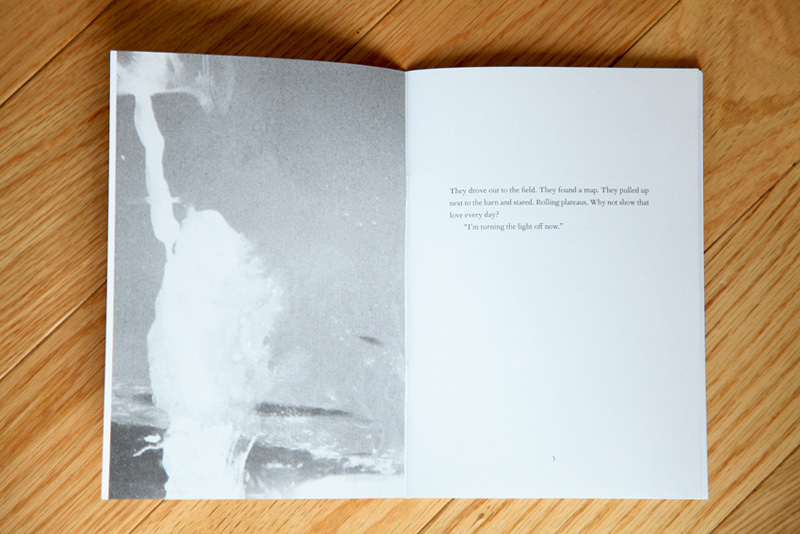 Ken Baumann: I only speak for me, but I feel emptied out by everything I write. I feel like I'm exorcising vocabularies. I love the feeling, more and more; that a way of thinking has been formulated and purged. Whether or not this feeling is a trick, whether or not I'm actually further embedding these thoughts is irrelevant to me. Sometimes, as is such in art, the invisible is actually pleasurable to watch move. I also feel moved in and out of moods when I write, but it doesn't feel as if I'm tapping a finite well of X. It feels more biologically deemed; chains of feedback and cascading response, mood into mood, further mood into new sensation, old into new, dead out. It's a constant build, and if done deeply and done right feels like redefining or blurring a state vs. intensifying it. G: What does the Garden of Eden mean to you? K: Many artists think silence is transcendental, that it's a fundamental peace, or honor, or an inescapable endpoint of all attempt at meaning. The void, the koan, the silent cry. I both love and hate this idea. The Garden of Eden might be a place without this dichotomy. G: There is a line in here that goes as such: "He took the pills. She took her pills." This tiny tweak is beautiful. Was this an edit or did it come out like this? K: Thank you. I don't remember exactly, but most of these matched lines were written in their existing order. Part of my rationalization that this book should exist to be read by other people is because of transitions like this. The aurally or structurally associative thought carrying inside it a hidden meaning, pregnant. G: Are you religious? How do you know you are not religious? K: I am mostly agnostic. I think the power and use of ancient rituals is self-evident, whether they belong to a religion or not. Making it so explicit and codifying such elusive thinking is just implosive enough a proof that I frequently wonder how any strictly religious people don't punch their head everyday. And that believing you can fit a notion of something so large inside said head, and deploy it against/into other people, often strangers, is irresponsible and hubristic. I enjoy and recommend hints and gusts. I don't know. I don't know. G: Do you feel that it is possible for one to be religious (believe in a God of some sort) without being aware of it? G: Do you like to enter a new city with a plan/guide or without one? How does this apply to "The Sky Went Red While He Was Inside"? K: I use guiding information. I am poisoned by comfort. This is a massive problem. “Call Out”, this book's container, itself a book, is about this problem and its face inside of me. G: Has the idea that we are living life backwards occurred to you? Could it be that we are moving away from the end and towards the very beginning? K: The idea feels familiar. I hope this is true. I'd rather live to see a species-wide beginning. Humans are everything and shockingly nothing, but I love them. G: What question did you think I was going to ask you and why do you think I refrained? K: How? Because you often love me.